Electrical: Wasnea Mah Engineering Ltd.
Archbishop Oscar Romero is a new high school for Edmonton Catholic School District No. 7. Using construction management to control the budget and a tight schedule, along with team effort, and an exciting design ensured the success of this project. 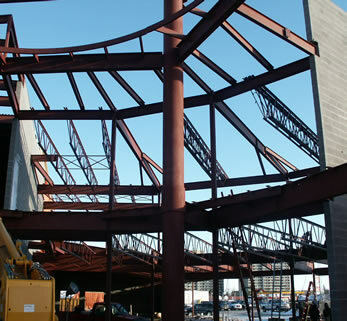 The structure is composed of a structural steel frame, with the exception of concrete masonry bearing walls at the gymnasium. Utilizing an innovative design of repetitive structural components on the building’s many curves ensured the most cost effective structural solution.